PIONONO WITH MANJAR BLANCO - ARGENTINIAN "JELLY ROLL". An Argentine/Peruvian dessert filled with milk pudding and berries. 1. 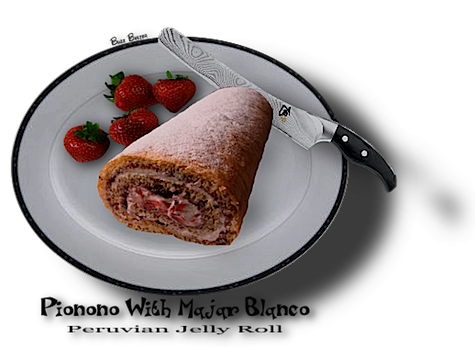 Line a jellyroll pan with parchment paper and set aside. Preheat an oven to 350° F.
2. Whisk together eggs and sugar and place in the top of a double boiler set over medium high heat. and cover the paper with powdered sugar. paper and trim cake to smooth sides. Let cake cool completely, then spread with Manjar Blanco. Roll cake and sprinkle the outside with powdered sugar. 7. To serve, slice cake to form spirals. Serve with Strawberry sauce if desired. to very low and simmer for 1½ to 2 hours, stirring and scraping the bottom of the pan to prevent sticking. and beat the mixture with a spoon for a few seconds. Let cool. constantly, until mixture thickens. Cook 2 minutes longer. Add strawberries and heat to serving temperature. 2. Serve as a dessert sauce for Pionono,  pound cake, bread pudding, pancakes, angel food cake or ice cream. NOTE: ALTHOUGH NOT THE EXACT RECIPE PRESENTED,  THE VIDEO BELOW MIGHT BE OF SOME HELP TO YOU.